Is wearable technology in stalemate? A few weeks ago I was pleasantly invited to Weareable Tech in Turin, a small Expo on wearbale technology. Since I had given a presentation at Glocal News in Varese the day before, I thought I’d kill two pigeons with one stone and make a detour to this beautiful North Italian city to see what’s going on in this realm. As you can read in one of their blog posts, about 19 million wearable devices were sold worldwide in 2014. Over 600,000 in Italy alone. A number that will definitely grow according to the market survey conducted by IDC (International Data Corporation), which provided 112 million pieces purchased by 2018. The interest around this field has been strong for years: “What​ was still missing was a comprehensive project able to systematize the knowledge and numerous reports that reached us from the network and the users “ Explains Fabio Lalli and just to think and map the evolution of the world that he and Mirko Lalli, together with the team of IQUII,​ They founded in February 2014, the first Observatory Wearable Technology​in Italy. According to to the data of the Observatory, the predominant fields in Italy are the medical one, with 47% of Italian companies already involved in this business. In second place we have wellness and fitness (35%), followed by gaming, security and home automation, in which six percent of Italian companies decided to invest. Apart from all this promising data, while entering the fair I had a feeling of…something being stuck in a rut. The location was quite dull, like it was all prepped up in the previous 30 minutes. This kind of techy conferences need to be visually flashy, appealing, eye-catching….well, it was everything but that. It felt like being in a giant card box. But apart from questioning the décor of the venue, let’s go through the content on display. I moved to another company who were showing Google Cardboard a virtual reality platform for use with a fold-out cardboard mount for a smartphone. It is intended as a low-cost system to encourage interest and development in VR and VR applications. Now, this is actually pretty cool and it costs about 20€ on Amazon. This is something that could work great and become viral, but not marketing efforts are behind it. I started talking to the “Director,” whatever that meant, to the company displaying the product. Cutting to the chase, he acted like a little arrogant spoilt little boy who just stopped using his pacifier the day before, thinking he was Steve Jobs. These people are 90% the time the reason why potentially interesting start-ups don’t take off. Well done mate. listening to Robert Andrecs, Head of Unit “EUROPA Site”, European Commission, DG Communication and Dana Manescu, Head of the Social Media Sector, European Commission, DG Communication. The European Commission’s online communication has become a significant component of EU political communication. It aims to reach new audiences and connect with citizens and stakeholders on the platforms they prefer and the devices they use. The Commission’s web presence is undergoing a massive digital transformation programme which aims at putting users’ needs first. The new web presence will be “mobile first” and integrated with social media. Find out more about the Commission’s web and social media communication and its plans for the years ahead. A question that was raised during the debate was “how can the EU communicate with one voice?” This is indeed a challenging issue for institutional communicators of such a simultaneously diverse, intricate but united organization and I believe a similar challenge is raised for other similar international organizations like the UN. This is was a good opportunity for me to mention the European Union’s presence at Expo 2015, the biggest event of 2015 and the biggest event on nutrition ever organized. The participation of the European Union at Expo 2015 is a project managed by the European Commission (more precisely by a task force of the Joint research Centre) but it is a European Union-branded project. In our communication we always refer to ourselves as European Union. This is a challenging task but it definetely helps EU and institutional communicators get an idea of how communicating on common global goals benefits the overall understanding of a European project. The Twiplomacy report is par excellence the guide book to the use of institutional tweeting or, as they better put it, it is an annual global study looking at the use of Twitter by heads of state and government and ministers of foreign affairs. For many diplomats Twitter has become a powerful channel for digital diplomacy and 21st century statecraft and not all Twitter exchanges are diplomatic, real world differences are spilling over reflected on Twitter and sometimes end up in hashtag wars. “I am a firm believer in the power of technology and social media to communicate with people across the world,” India’s new Prime Minister Narendra Modi wrote in his inaugural message on his new website. Within weeks of his election in May 2014, the @NarendraModi account has moved into the top four most followed Twitter accounts of world leaders with close to five million followers. As of 25 June 2014, the vast majority (83 percent) of the 193 UN member countries have a presence on Twitter. More than two-thirds (68 percent) of all heads of state and heads of government have personal accounts on the social network. Since his election in late May 2014, India’s new Prime Minister @NarendraModi has skyrocketed into fourth place, surpassing the the @WhiteHouse on 25 June 2014 and dropping Turkey’s President Abdullah Gül (@cbabdullahgul) and Prime Minister Recep Tayyip Erdoğan (@RT_Erdogan) into sixth and seventh place with more than 4 million followers each. Modi still has a ways to go to best U.S. President @BarackObama, who tops the world-leader list with a colossal 43.7 million followers, with Pope Francis @Pontifex) with 14 million followers on his nine different language accounts and Indonesia’s President Susilo Bambang Yudhoyono @SBYudhoyono, who has more than five million followers and surpassed President Obama’s official administration account @WhiteHouse on 13 February 2014. In Latin America Cristina Fernández de Kirchner, the President of Argentina @CFKArgentina is slightly ahead of Colombia’s President @JuanManSantos with 2,894,864 and 2,885,752 followers respectively. Mexico’s President Enrique Peña Nieto @EPN, Brazil’s Dilma Rousseff @dilmabr and Venezuela’s @NicolasMaduro complete the Latin American top five, with more than two million followers each. followers) and South Africa’s Jacob Zuma (@SAPresident) (325,876 followers). Here is an interesting project I have found a couple of days back. Twopcharts made an effort to find the most influential active Twitter users for cities around the world, as well as widely spoken languages. By selecting any of the cities or languages available in their database, you will be directed to a dedicated page with several lists and search capabilities. Twopcharts have also created a number of twitter tools that can be used for any Twitter account. As they say in their about page, they welcome any suggestions you may have. You display engagement with your audience. You look kind and friendly. You look like you’re trying to sell a second-hand car. 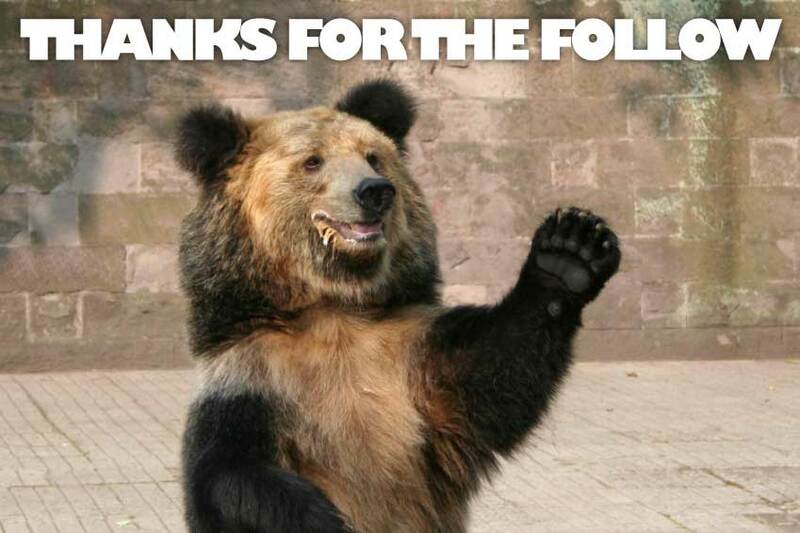 Acknowledging your network is absolutely golden, but is thanking for the follow the right way to do so? 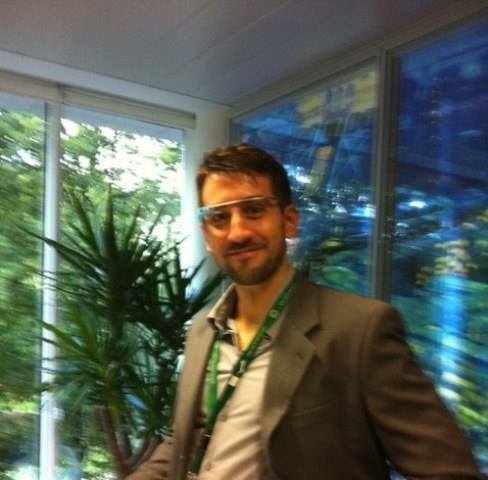 I tried Google Glass…and I liked it. But, do I need it? Right, here we go. I finally managed to try Google Glass. It was at Google’s offices in Brussels (lovely offices by the way) some time ago. I had a lot of expectations from this product. I had noticed already that a few well-known communications and innovation experts had been already given Google Glass for trial and test but still it was hard for me to understand what this item could actually do. Besides, the hype around them has been really huge especially since the release of the first teaser video in 2012 so, I was very curious. The presentation was lovely with a group of well-prepared young American (I think all of them were) Google employees who had been touring around Europe and the rest of the world to provide Google Glass demos. Google Glass is interesting for specific uses, but you’re going to struggle to find a use for them all the time. It didn’t seem like they’re going to replace looking at your smartphone any time soon. The device lent to me was both light and comfortable possibly also because I’m used to wear glasses . You can wear Google Glass without lenses, so you just have the frame, although Google is planning to make them adaptable for actual prescription lenses. The frame is made of titanium, which you can bend to fit your face without breaking. Now, let’s talk frankly. When you wear them, you don’t look that cool. Although the Swedish designer did a great job making such device sort of conceivable, you still look a like Vegeta from Dragonball Z who is now claiming that he used to wear Google Glass before it was cool. 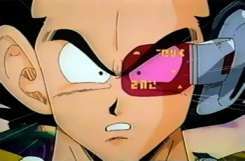 See picture below in case you were born out of the Dragonball Z generation. The presenter explained that in some cases, it might be good to put up an American accent but that sound recognition is constantly being assessed and improved. A problem with the voice command is that obviously you are not inaudible. Think about other people’s reactions when hearing a man just shouting things out loud. Can you imagine being on the bus and say “OK Glass, give me directions to the nearest sushi shop…” or something like it, or worse, witnessing something unusual on the streets and start shouting “PHOTO, PHOTO, PHOTO!!!! !” or “RECORD A VIDEO, RECORD A VIDEO!!! !” Let’s not forget that “normal people” don’t do so. There is a way around this of course. You don’t really need to say: “OK Glass, take a picture”. You can just press a button on the top of the sidepiece, or hold it down for video. But then, why wouldn’t you do it with your smartphone? This brings up the notorious privacy issue since there’s no warning to anyone around you that you’re taking photos or videos. Still, there are plenty of similar conceivable devices already available on the market so I don’t see why this very product would create a different case study. One of the key strengths of this product is that it shows a considerable effort by Google to impose themselves as innovators. In fact, I see how some niche markets could make good use of Glass like in the medical sphere, in technological research or even (why not?) in sports refereeing. On the other hand, regular people don’t need to walk around needing to Google things. We use our smartphones for that. In 2000 Bill Gates foresaw that printed paper would disappear by 2007. As we all know, this turned out to be a reckless forecast. Even though digitalization and the actual number of computers (including desktops and laptops) has grown by 1000% since then, even though we have witnessed the advent of e-mails, chats, the web and cloud computing, paper has still not abandoned us. Right, we can record a light decrease but we must also consider that the economic crisis has reduced drastically the production and usage of paper of many Western businesses. Even though tablets are beating sales records since 2008, black on white print-out is still the most comfortable, pleasant and healthy way to read. Especially in the office environment we enjoy reading print-outs in order not to tire our eyes and have the opportunity to scrabble on them. The morale that this data tells is that gurus’ ideas can be often creative but reckless and what is worse is that they are passed on new generations…on paper obviously. Does social networking make us less social? 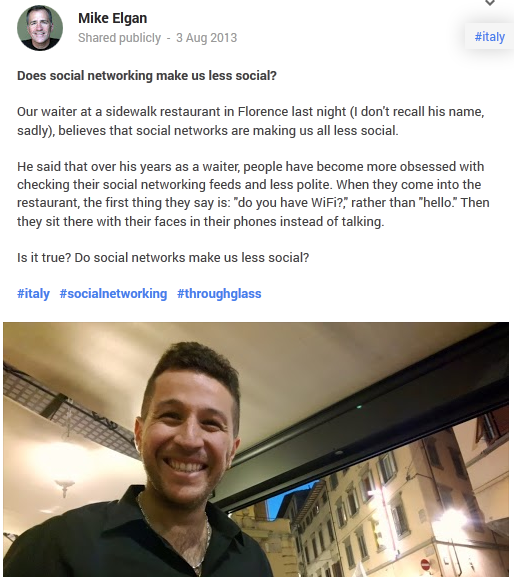 Our waiter at a side walk restaurant in Florence last night (I don’t recall his name, sadly), believes that social networks are making us all less social. He said that over his years as a waiter, people have become more obsessed with checking their social networking feeds and less polite. When they come into the restaurant, the first thing they say is: “do you have WiFi?,” rather than “hello.” Then they sit there with their faces in their phones instead of talking. Is it true? Do social networks make us less social? The post received over 165 plusses and 80 comments, demonstrating how the issue is very interesting to people. I think the definition of being social has to be revised, meaning that the offline and online aspects of this activity have to be merged. Is somebody who is very socially active online not a sociable person?